Fifty Shades of 4 Ply: Rock Those Socks Make-Along - The Pattern! Eeeeeeeee!!!!! What a time I've had working out how to share a PDF on this blog!!!! Anyways.....back to the subject in hand! Today we are putting all the tutorials and instructions together and publishing patterns! Sarah's pattern is over on her blog HERE! Ok, ok, ok....I know....her PDF is way better than mine! I have to confess that I may have a little PDF envy!!! I just love her Chevron Sock design. I can see lots of these being made! She made them with Scheepjes Invicta Colour, a gorgeous slow colour changing sock yarn. I've put together a written pattern for the stripy socks. I'm working like crazy on the lace version. I've loved seeing all your sock creations, both knitted and crocheted! I'm truly amazed at how different they all are. A per usual....Sarah's Ravelry group is HERE. Can can find the pattern PDF by clicking HERE! 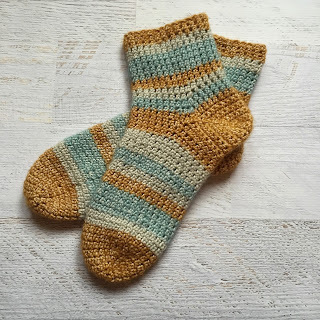 I used Scheepjes Stone Washed yarn for my socks. It's one of my all time favourite yarns. I just love it! You can find all the posts on this blog relating to the make-along HERE. I'll also update my tutorial page to include the patterns and blog posts over the next few days. Like your socks, and colours! 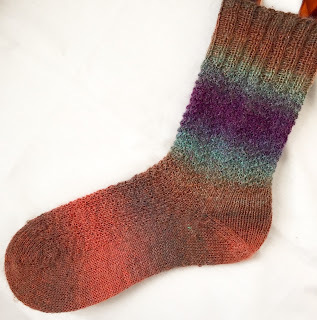 I just knitted my first pair of good-fitting socks with the Fish Lips Kiss heel and I'm planning to make my next pair out of Scheepjes Stonewashed yarn. Just for those lazy days/evenings at home. The reason I said 'good-fitting socks' was because I have wide feet and most 'standard' sock patterns don't match my feet's circumference (experience has taught me the hard way). The FLK-heels are my favorite heels, because they look like regular short-rows but fit a lot better (and I'm not a fan of heelflap and gusset socks, because I don't like the look of them).